As part of the ongoing commitment to provide superior police services to the community, the Ontario Police Department has implemented a geographical based policing program. As part of this “Geo-Policing” program, the city has been drawn into three geographical areas: West, East, and South. 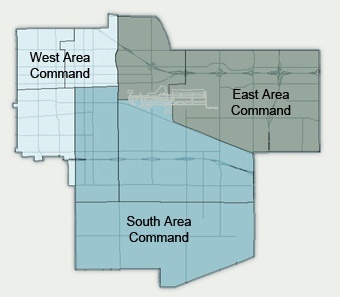 Each area has an assigned Lieutenant as Area Commander. The Area Commander is responsible for the delivery of police services in their area of control with an emphasis on the preservation and improvement of the quality of life, safety, and economic value of those who live and do business in the city. Each area has dedicated teams of officers and corporals, headed by police sergeants, who work day-to-day (24/7) patrol operations; traffic officers; Community Oriented Problem Solving (C.O.P.S.) officers, who work special projects; narcotics investigators; and detectives. Please consider your Area Commander to be your direct point of contact for any non-emergency issue facing your neighborhood or business. Lieutenant Troy Scutella began his law enforcement career in 1996 with the Ontario Police Department. Lieutenant Scutella has had the privilege of working several assignments with the Ontario Police Department. Lieutenant Scutella has worked Patrol, Bike Patrol, Special Weapons and Tactics (SWAT), Crimes against Persons Investigations, Homicide Investigations, Narcotics, Career Criminal Team, Range and Officer Training Team and coordinator for the Community Youth Explorer program. Lieutenant Vince Carrillo began his law enforcement career in 1998 with the San Fernando Police Department. Before becoming a police officer, he was honorably discharged from the United States Marine Corps. In 2002, Lieutenant Carrillo was hired by the Ontario Police Department as a police officer and has had the privilege of working several assignments. Lieutenant Carrillo has worked Patrol, Narcotics as an Officer and Sergeant, Field Training Program, Special Weapons and Tactics (SWAT), Crimes against Children Investigations, Homicide Investigations, Multi Enforcement Team, and Internal Affairs.Lieutenant Carrillo holds a Bachelor's Degree from the California State University of Long Beach. Lieutenant Birkett began his law enforcement career in 1995 as a Deputy with the Orange County Sheriff's Department. Before becoming a Deputy Sheriff, he was honorably discharged from the United States Marine Corps. Lieutenant Birkett joined the Ontario Police Department in 1997 and has had the privilege of working several assignments. Lieutenant Birkett has worked Patrol, Canine Handler, Field Training Officer, and as a Detective investigating general crimes and crimes against person investigations. He has also worked as a Patrol Supervisor, supervised the Ontario Mills Mall, and as an Internal Affairs Supervisor, Range Staff Supervisor, and an Airport Bureau Supervisor. Lieutenant Birkett also held a position as an Alternate Airport Security Coordinator for the Ontario International Airport Authority. Lieutenant Birkett is a supervisor with the Department's Administrative Investigation Team and Labor Relations Unit. Lieutenant Birkett holds a Bachelor's Degree from California State University San Bernardino in Business Management.